As you can see that Rafa Nadal leads Novak Djokovic by 870 points & Rafa Nadal isn't defending any points at Australian Open, so, irrespective of what ever happens at Australian Open, 2014, Rafa Nadal's #1 ranking is 100% assured post Australian Open, 2014. (i) Will Novak Djokovic be still ranked No. 2 after Australian Open, 2014, if he has an early exit at Aus Open? (ii) How much the points difference will be between Novak Djokovic & Rafa Nadal after Australian Open, 2014? (iii) Will Roger Federer still be in Top-8 if he loses before the semi-finals of Australian Open, 2014? (iv) What would be the ATP points of Top 4 be in the ATP Ranking points to be declared on 27th January, 2014 (after Aus Open, 2014)? (v) Will Andy Murray reach No. 3 if he wins Aus Open, 2014 or if he reaches the final of Australian Open, 2014? 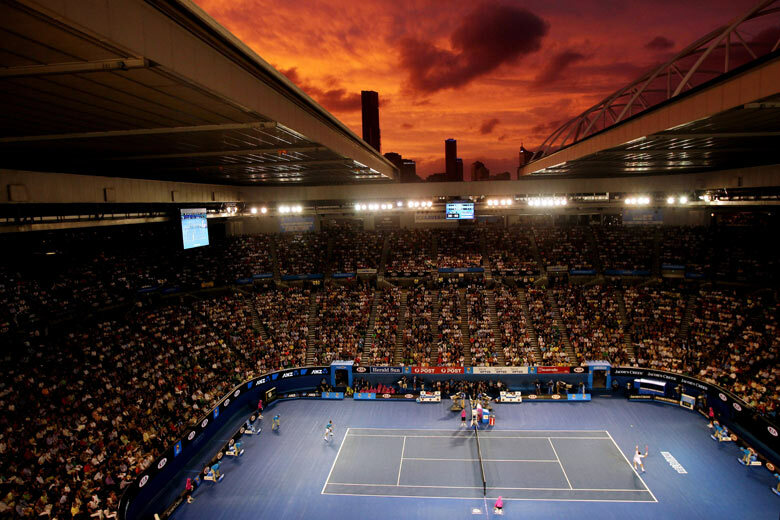 (vi) How many ATP ranking points are at stake during Australian Open, 2014? (vii) As Juan Martin Del potro has lost in the 2nd Round of Australian Open, 2014, will we see a fall in rankings for him? (viii) How far can David Ferrer go in the rankings if he reaches the Quarter Finals or semi-finals or finals of Australian Open, 2014 or wins it? (ix) What are the ranking scenarios for Tomas Berdych, Jo-Wilfried Tsonga at Australian Open, 2014? (x) The surprise package of Australian Open, 2014 has been the 62nd Ranked Bautista Agut who has surprised every one by reaching the 4th Round of Australian Open, 2014. Read on this detailed explanation to know how much improvement will we see in his rankings & that of Grigor Dimitrov post Australian Open, 2014? Before we go any further, let me firstly remind you how many ATP ranking points are at stake in the Grand slams including Australian Open, 2014? 1. The winner gets 2000 points. 2. The losing finalist gets 1200 points. 3. The losing Semi-finalist gets 720 points each. 4. The losing Quarter-Finalist gets 360 points each. 5. The loser of Round of 16 (Round-4) gets 180 points each. 6. The loser of Round of 32 (Round-3) takes 90 points each. 7. The loser of Round of 64 (Round-2) gets 45 points each. 8. The loser of Round of 128 (Round-1) gets 10 points each. How many points the Top 10 have to defend at the Australian Open, 2014? Roger Federer had lost in the Semi-finals at Aus Open, 2013, so he has to defend 720 points at Aus Open, 2013. Novak Djokovic is the defending champion as he had won the Aus Open 2013 , so, Djokovic will be defending 2000 points at Aus Open, 2014. Rafael Nadal had skipped Aus Open, 2013, so, he isn't defending any points. Andy Murray had lost in the final of Aus Open, 2013 to Djokovic, so he has to defend 1200 points at the Aus Open, 2014. David Ferrer lost in the SF of Aus Open, 2013, so Ferrer is defending 720 points at the Aus Open, 2014. Tomas Berdych lost in the Quarter Finals of Aus Open, 2013, so Berdych is defending 360 points at the Aus Open, 2014. Del Potro had lost in the R3 of Aus Open, 2013, so Delpo had to defend 90 points at the Aus Open, 2014. Tsonga lost in the QF of Aus Open, 2013, so Tsonga is defending 360 points at the Aus Open, 2014. Wawrinka had lost in the 4th round of Aus Open, 2013, so he had to defend only 180 points at the Aus Open, 2014. Richard Gasquet lost in the 4th Round of Aus Open, 2013, so Gasquet is defending only 180 points at the Aus Open, 2014. No. 1 & No. 2 rankings are fixed already, even if Novak Djokovic retains his Australian Open, 2014 title, Rafael Nadal will remain No. 1 post Aus Open, 2014. & if Rafa Nadal wins the Aus Open, 2014, he will have a lead of 3670 points over Novak Djokovic post Aus Open, 2014. If David Ferrer loses before semis of Australian Open, 2014, then he will fall at least by 1 ranking position & Del Potro will be above Ferrer in the Ranking post Aus Open, 2014. If Andy Murray loses before the finals of Australian Open, 2014, he will fall out of Top-4 for sure. If Ferrer loses before semis, Murray before finals of Australian Open, 2014, then Del Potro will rise up to 3 in the rankings (provided Wawrinka or Berdych or Federer don't win Australian Open, 2014). If Roger Federer loses in the 4th Round of Australian Open to Jo-Wilfried Tsonga, he will fall to #8 in the rankings. Federer will how ever, remain in the Top-8 post Australian Open, 2014 until & unless, Tsonga doesn't reach the finals of Aus Open, 2014. On the up side, if Roger Federer reaches the finals of Aus Open, 2014, he can at best reach #5 & if Federer wins Aus Open, 2014, he can reach #3 post Aus Open, 2014. Stan Wawrinka : can reach up to #5 in the rankings if he reaches the finals or at best, #3 if he wins Aus Open, 2014. Tomas Berdych: similarly, Berdych can reach up to #5 in the rankings if he reaches the finals or at best, #3 if he wins Aus Open, 2014. Tsonga will replace Gasquet as #9 if Jo reaches QF of Aus Open, 2014 & Tsonga can get to a best of #8 if he reaches finals of Aus Open, 2014 & that would mean, Federer will be out of Top-8. Roberto Bautista Agut : By virtue of reaching 4th Round, Roberto has assured himself of #52 ranking, if he reaches QF of Aus Open, he will assure himself of #39 ATP Ranking & if he reaches the semis of Aus Open, he will assure himself of #23 ATP Ranking post Aus Open, 2014. Grigor Dimitrov: By virtue of reaching 4th Round, Grigor has assured himself of #20 ranking, if he reaches QF of Aus Open, he will assure himself of #19 ATP Ranking & if he reaches the semis of Aus Open, he will assure himself of #14 ATP Ranking post Aus Open, 2014. This is how fast rankings change if you do well at Grand Slams. For any query, drop in a comment or follow me on any of the social networking sites. I will post a tabular form of the ranking data to make it easier for you all by Monday . So, now that Roger Federer has reached QF of Australian Open, 2014, that means he will remain in Top-8 post Australian Open, 2014 & for *at least* five more weeks or at least till the end of Dubai Open, 2014 (03/03/2014). That would mean that Roger Federer has now assured himself of completing 590 weeks in ATP Top-8, which in itself is again a record :-). After beating Novak Djokovic, Stan Wawrinka for the first time in over a decade has increased his chances of being the No. 1 Swiss player. Stan Wawrinka will be the No. 1 ranked Swiss player, unless Federer reaches the finals of Australian Open, 2014. Roger Federer (before QF match) is on 3995 points, if he wins the QF vs Murray, he will be on 4355 points. (i) If Rafa Nadal wins the Aus Open, 2014, he will be 4510 points ahead of Novak Djokovic & that perhaps, would mean, he will ensure his No. 1 ranking till the start of Madrid Masters, 2014. (iii) Andy Murray will reach No. 3 if he reaches finals of Aus Open, 2014 or wins the title, if he loses in the QF, Murray will either be #6 or #7 depending on how far Federer goes..
(iv) Wawrinka or Berdych if they win Aus Open title, 2014, will get to #3, else, one of them is assured to be #5 or #6 in the rankings. what about young player nick kyrgios (aus)? How would an all-Swiss final play out for rankings? He will be close to 163 in the rankings when the ATP will announce rankings post Aus Open, 2014.